What’s so “special” about special meals? While people who order special meals always get their food first, I see no reason to surrender the glorious spontaneity of choosing whether to indulge in the fish or tortellini option when the flight attendant comes around. What’s so special about special meals anyways? I was made to reconsider when the gentleman next to me clarified what the NLML-label on his meal stood for on a recent flight to Dubai. Because of his milk allergy, my seat neighbor had pre-ordered the lactose-free special meal (NLML), just one of many special meals offered by most airlines on medium- to long-distance flights. He explained how special meals are targeted towards airline passengers with special dietary or religious needs, and ranges everything from Vegetarian or Gluten-free choice to Halal or Kosher options. Children’s meals and Baby food are also available under special meals, as is the option to select a general special meal, or SPML, where rare allergies can be specified and addressed. I looked more closely into the topic later on, and found that recent trends seem to be showing an overall increase in the provision of special meals on board. This is likely due to the more diverse and international demographic of airline travelers as well as other broad cultural trends that advocate healthier eating. For airline caterer LSG Sky Chefs, vegan meals (VGML) and lacto-ovo vegetarian meals (VLML) are the most popular choices among passengers who order special meals, while Muslim meals (MOML) are requested third most. I further found that airline caterers work with nutrition specialists in developing their menus – including those for special meals – in order to ensure that the necessary nutritional elements are present in the meals. While they are assembled separately and labeled differently to ensure precision, the special meals are prepared according to the same standard and quality as all other meals. 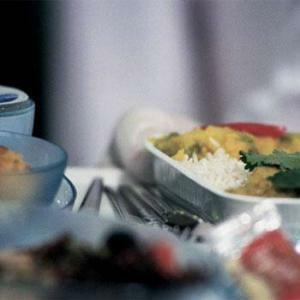 Airlines naturally want their passengers to feel comfortable and at home when travelling with them – especially on longer flights – so the provision of special meals that address specific dietary needs is important. My seat neighbor, an older gentleman, told me that he signs up for the lactose-free special meal as soon as he books his flight, making it one less thing he has to worry about later on. While I will continue living spontaneously (I went for the salmon this time), I can rest assured that my days of airline travel will continue regardless of any future food allergies or ailments I may encounter.